The last king of Judah was Zedekiah, a son of Josiah, whom the Babylonians defeated in 587 BC. Ten years previously, Zedekiah’s predecessor and nephew Jehoiachin (Matthew’s “Jeconiah”) was carried into Babylonian exile. In Babylon, his descendants (mainly in the line of Hananiah son of Zerubbabel) were prominent leaders of the exiled community. At some point, they began to be called by title “exilarch,” a Greek rendition of the Aramaic title resh galuta’, “head of the exiled community.” The Exilarchs enjoyed a life of ease and much of the pomp and pageantry associated with royalty, but their actual authority was restricted to internal Jewish matters. In the land of Israel, the post-exilic fortunes of the house of David are a bit more murky. In Eretz Israel, those who reorganized the nation following the Exile made the ancient ruling families the basis of order. Originally, the heads of these prominent families were the rulers of the various tribes. These dominant families had probably already assumed leadership of the people during the exile, when they may have served as rulers and judges (Ezek 8:1; 20:1). Later, many Jews returned to their homeland, at which point these family patriarchs functioned as representatives of the people. It was they who negotiated with the Persian provincial governor (Ezr 5:9ff) and, in association with the “governor of the Jews,” directed the reconstruction of the Temple (Ezr 5:5, 9; 6:7-8, 14). This lay nobility is often described in rabbinic literature as “the eminent men of the generation,” “the eminent men of Jerusalem,” or “the leading men of Jerusalem” (Joachim Jeremias, Jerusalem in the Time of Jesus [Fortress, 1969] 225). We read of them in the New Testament, where Luke speaks of “the principle men of the people” (Lk 19:47). Jeremias argues that the many references to “the elders” of Israel, who with the chief priests and scribes constituted the Sanhedrin, in fact describe this lay nobility. For the most part, they would have held to Sadducean values and beliefs (Jeremias, 228-229). Joseph of Arimathea (Mk 15:43; Mt 27:57; Lk 23:50-51; Jn 19:38-42), a rich landownder, was probably a representative member of this group. on the 1st of Tebet…an additional offering, and a wood offering [by the family of Parosh].” (Jeremias, 226-227). This list is most likely from the early post-exilic period, probably deriving directly from the casting of lots to provide wood recorded in Neh 10:35-37 and 13:31 (Jeremias, 227). Their ability to provide wood needed for the sacrificial cultus indicates that they were people of some means, and that their position could involve financial sacrifice. The family of David is included among the patrician families of post-exilic Israel, as would be expected. The entire patrician class, however, comprised a very small group. Elishah ben Abuyah (born before AD 70) stated: “My father Abuyah was one of the notable men of Jerusalem. At my circumcision he invited all the notables of Jerusalem” (Jeremias, 225). This suggests that the “notables of Jerusalem” could all gather in one room and formed a close social circle. The Bible recognizes three distinct Davidic lines that issued from Zerubbabel. If he had a foreign wife whom he divorced in compliance with Ezra’s reforms (Ezr 10:16ff), there were likely other lines as well (and later Jewish tradition in fact claims he had two foreign wives). It is likely that the full prestige of Davidic ancestry—and the full burden of civic responsibilities—would fall only on the line of Meshullam, Zerubbabel’s eldest son (from a Jewish mother). In practical terms, what did membership in the house of David mean in the time of Jesus? Senior members of the family would have been members of the Sanhedrin, as noted above. With the rest of the Sanhedrin, they had a ceremonial duty on the Day of Atonement in accompanying the man who led the “goat for Azazel” into the wilderness (m.Yom 1:5). They would also have been responsible for their family’s offering of wood for the altar on the 20th of Tammuz every year. Overall, however, the importance of the lay nobility in general was not very great in the time of Jesus, as is demonstrated by the meagerness of the evidence (Jeremias, 222). The Talmud relates that the custom during the Second Temple period was that the kingship belonged to the Hasmonean and Herodian dynasties, which wielded political power. On religious matters, however, the people were led by a “Prince” or “Patriarch” (nasi’). The nesi’im were either of Davidic descent or, if not, were appointed by an assembly of judges or by the Sanhedrin. At this point, we need to consider another prominent line in the Davidic genealogy: that of Hillel the Great. By the end of the first century and especially after the Bar Kochba Revolt of 132-135 AD, the Palestinian nesi’im were usually chosen from among Hillel’s descendants, apparently beginning as early as Gamaliel II (90-110). By rabbinic tradition, Hillel was a descendant of Elnathan, governor of Judea in the post-Exilic period, who was in turn a descendant of David through his son Shephatiah. He thus belonged to a non-royal Davidic line in his patrilineal descent. Elnathan, however, married Shelomith, the daughter of Zerubbabel and thus of the Solomonic line. This makes Hillel a descendant of David through two different ancestral lines, that of Solomon and that of Shephatiah, comparable to the way Jesus’ genealogy is traced through both Solomon (Mt) and Nathan (Lk). A tradition attributing Davidic lineage to the patriarchs led to messianic speculation regarding them. Some rabbinic figures attacked this position, as did the church fathers in the Byzantine period. The office, which was held by descendants of Hillel, was abolished by the authorities in Palestine in 425 BCE (Christine E. Hayes, “Nasi’,” The Oxford Dictionary of the Jewish Religion, ed. R. J. Zwi Werblowsky and Geoffrey Wigoder [Oxford, 1997], 494). The social role of the Davidic dynasty was thus much different in the time of Jesus than it was 600 years previously. Rather than being kings and warriors, the most prominent heirs of David were halachic interpreters. This shift no doubt served to enhance the general expectation of a Davidic messiah, both by highlighting the religious significance of the dynasty and by simultaneously denying it the trappings—and the accompanying power—of royalty. What might life have been like for members of the house of David who did not occupy the most senior positions in the family? Here there are numerous traditions, both Jewish and Christian, that point to the possibility that many Davidides lived quite modestly. To continue with Hillel: the great halachic scholar was born to a wealthy family of merchants in Babylonia (b.Sotah 21a). He wanted to study the Torah, however, and his parents did not approve of this decision. Therefore he traveled to Jerusalem without their financial support and worked as a woodcutter. It is said that he lived in such great poverty that he was sometimes unable to pay the admission fee to study Torah, and because of him that fee was abolished. According to Christian tradition, Mary’s father Joachim was a shepherd with a sizeable flock, but he consistently donated most of it for sacrifice in the temple or for the poor, resulting in a very modest lifestyle for him and his wife. The common thread in both of these stories is the theme of voluntary poverty in the service of God. Hillel turned his back on a life of ease in order to study the Torah; Joachim gave away much of his wealth in the service of God. It is beyond dispute that Joseph and Mary were poor. According to Luke 2:24, they did not offer the customary offering of a pigeon or turtledove and a lamb when presenting Jesus in the Temple (Lev 12:6-8). Rather, they took advantage of a provision in the Mosaic law that allowed those of modest means to offer a less costly sacrifice: “a pair of turtledoves or two young pigeons” (Lk 2:24). This was actual poverty—more like Hillel who legitimately could not pay for his classes than like Joachim who gave freely out of his abundance. Everything the Bible tells us Joseph and Mary’s character indicate that if they had the means to provide a lamb, they would have done so. But how did they arrive at this state of poverty? Was it by choice like Hillel? Hillel became poor because he separated himself from his father’s financial support in order to study Torah. Was there some motivation for Joseph to cut himself off from a ready source of wealth for some religious goal? It may well be that Joseph, “a righteous man,” customarily gave as much to charity as possible. In other words, he had wealth enough but chose to spend almost all of it on others. 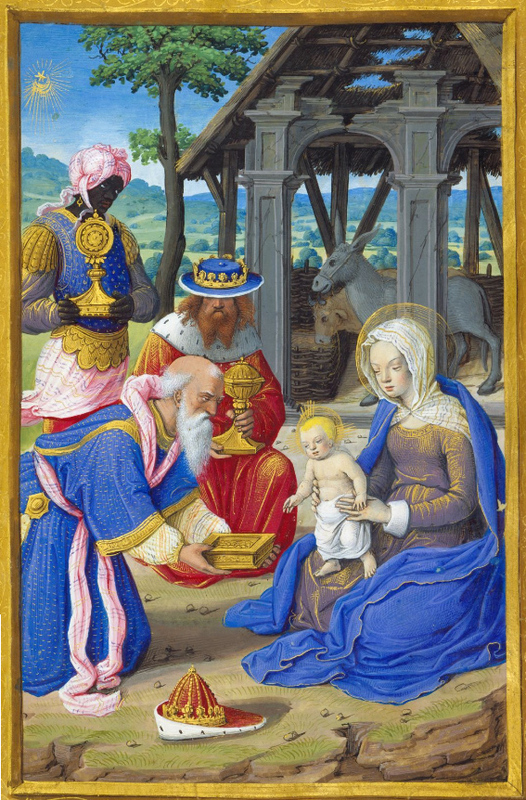 Perhaps this is what he did with the gifts of the Magi (Mt 2:12). But again, this theory does not jibe with his inability to offer a lamb for Jesus—which was also a religious obligation a righteous man would be duty-bound to honor if at all possible. Other factors were almost certainly involved. One possibility has to do with Herod’s rise to power in 37 BC. At this time, Josephus reports, Herod put to death “all the members” of the Sanhedrin (Ant. 14:175). According to Antiquities 15:6, he also put to death “forty-five of the principal men of the party of [the Hasmonean priest-king] Antigonus.” In short, Herod would not tolerate any threats to his power and dealt with any potential rivals with swift brutality. Throughout his long reign not even his own wives and sons were safe from his jealousy. Matthews account of the slaughter of the Holy Innocents (Mt 2:16) is not at all out of character with what we know of Herod from extrabiblical sources. Furthermore, we should note that Herod’s own precarious claim to the throne rested more in his alliance with Rome than with his own pedigree. Herod was an ethnic Idumean, and even though this people had previously converted en masse to Judaism, the fact remains that he was a descendant of Edomites (cf. Obad). This fact helps to explain his agitation at news of one “born king of the Jews” in Matthew 2:2. It is thus entirely possible that any Davidic claimant might have become a victim of Herod’s thirst for power. Clearly, some Davidides (those who were members of the Sanhedrin when Herod came to power, as well as any partisans of Antigonus) were killed outright. It does not require much imagination to envision others fleeing houses and lands to protect themselves and their families. Might Joseph’s own father have lost his life or livelihood in Herod’s rampage? In such a situation, Joseph (or his father) may well have been reduced to poverty and chosen to “lay low” in Nazareth, far from Jerusalem, supporting himself by working as a simple carpenter. they said that between the two of them they had only nine thousand denarii, half belonging to each of them; and this they asserted they had not as money, but only in thirty-nine plethra of land, so valued, from which by their own labor they both paid the taxes and supported themselves. As in the case of many village artisans, Joseph’s trade was not an alternative to working the land, but a way of surviving when the family smallholding could no longer fully support the family. It did not necessarily put Jesus’ family any higher on the social ladder than most of the peasant farmers of Nazareth. By Darrell Pursiful in New Testament on August 14, 2010 .